They only have guest rooms one side of the hotel, and they all have balconies, so you really can’t go wrong with this property. They also have a very spacious accessible room with a roll-in shower. And since the property is on Navajo land, they aren’t really bound by any US access laws; so they made the access modifications because they wanted to, not because they had to. There’s something to be said about attitude! The one drawback of the accessible room is that the roll-under sink is right next to the fold-down shower bench, so it’s not possible to make a lateral transfer. Still, if you can bump up the slight lip to the shower, there’s plenty of room for a front transfer. And if you don’t stay at the hotel, consider having dinner at the on-site restaurant, so you can enjoy the magnificent show Mother Nature puts on at sunset. Every day is different, but it’s always very memorable. On the other hand, we just picked up a rotisserie chicken and some sides and enjoyed them on our balcony (highly recommended). And of course, there’s nothing better than a glass of wine at sunset. Although there is a 17-mile driving trail out around the monument, it’s really not recommended for passenger cars. Trust me, I tried the first bit of it and turned back. The View Hotel is an excellent alternative to the drive, as you can enjoy the changing light and colors from the comfort of your own room. You know what they say – location is everything – so check out The View Hotel on your next Monument Valley visit. It’s definitely worth the drive! 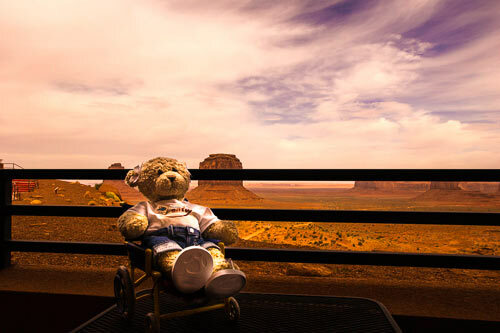 This entry was posted in Lodging, Traveling Cherrie and tagged accessible travel, barrier-free, disabled travel, hotel, monument valley, road trip, roll-in shower, slow walkers, The View, travel, wheelchair by Candy B. Harrington. Bookmark the permalink.